Camping can be an expensive hobby. Whether you are going on a backpacking expedition or setting up a tent for just one night, the cost of all of the equipment you need can really start to add up. One piece of gear that you don’t want to cut out of the budget is a sleeping bag. Sleeping bags can cost anywhere between $18 and several hundred dollars, but it is possible to find a quality sleeping bag for a good price. In general, sleeping bags are priced based on the quality and quantity of the materials they are made with, as well as any special features or accessories that they have. 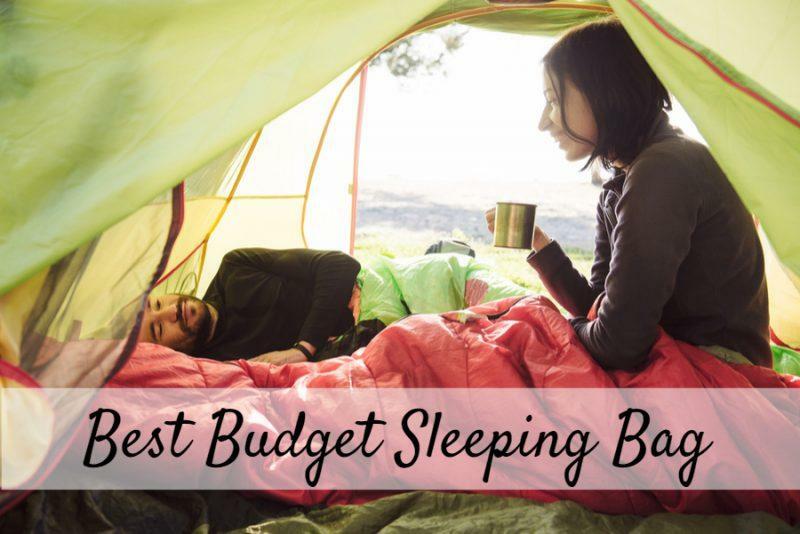 So, when looking to purchase a sleeping bag on a budget, you will have to find a balance between the features you need and want with the amount you are willing to spend. What do you need to know about budget sleeping bags? How It Will Hold Up To Weather: It is reasonable to think about the type of weather you will encounter when sleeping outdoors, so this is one of the first and most important factors that most people consider when searching for a sleeping bag. In fact, the weather you will endure while using your sleeping bag determines many of the features to look for. First, each sleeping bag is temperature rated—this indicates the lowest temperature at which the sleeping bag will keep you warm while wearing one layer of clothing. Most sleeping bags are rated between +15 degrees Fahrenheit and +50 degrees Fahrenheit, but some are rated as low as -40 degrees Fahrenheit. Since warmth is perceived and that one layer of clothing can vary, it is best to choose a sleeping bag that is rated for a lower temperature than you expect to experience, just to be on the safe side. Weather also includes any precipitation. If there’s a chance you will get rain, snow, or any other kind of moisture, it is crucial that your sleeping bag be at least water resistant because a wet sleeping bag can be dangerous. Even if you don’t expect to encounter precipitation, it is still a good idea to err on the side of caution and have a sleeping bag that resists moisture. Many sleeping bags are made with water resistant materials, but they can also be treated with a water proof substance for extra protection. How Heavy It Is: If you plan on carrying your sleeping bag any significant distance (i.e. backpacking), its weight could become an issue. Usually, the warmer the sleeping bag, the heavier it is, and the more it costs. Because of this, most budget sleeping bags are rated for higher temperatures or are considered to be summer bags. But if this doesn’t jive with your camping expedition, there are some cold weather bags that are budget friendly, too. Its Shape and Size: While the shape and size of a sleeping bag doesn’t play a particularly large role in its price, it does impact warmth and comfortability. Generally, a fitted sleeping bag keeps more warmth inside, but it allows for limited movement. Knowing this, you can consider the 4 main sleeping bag shapes: rectangular, barrel shaped, mummy, and double wide. As you might expect, rectangular sleeping bags are shaped like a rectangle, but they provide lots of space and comfort. The barrel shape is like a modified rectangle that is wider at the shoulders and narrower at the feet; this makes them spacious and slightly warmer. 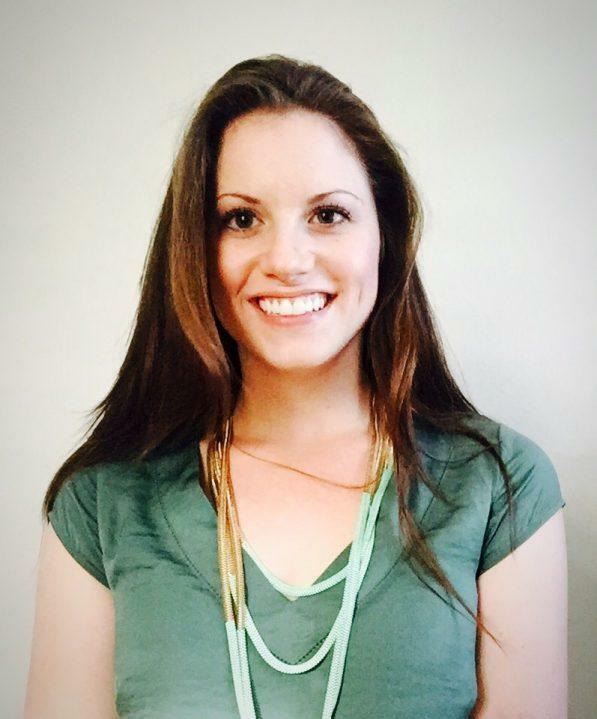 The mummy shape is the most fitted of them all and hugs the entire length of your body; this shape provides the most warmth and least amount of movement. Double-wide sleeping bags are essentially the size of two rectangular sleeping bags and are meant to sleep two people. Although double-wide sleeping bags are spacious, there are two bodies to keep heat in. Because sleeping bags vary in shape and size, it’s important to check the specific dimensions of the product you want to buy to ensure it will fit your body. For example, mummy bags are narrow, so they may not fit all body sizes whereas rectangular or barrel-shaped bags are more accommodating. Be sure to give yourself an extra couple of inches all around, depending on the shape you choose. You may also want to take note of the zipper on the bag you wish to purchase. Some bags have full-length zippers for easy entrance or the option for ventilation while others have shorter zippers to keep warmth in. What It’s Insulated With: Sleeping bags are insulated with either synthetic fill or down fill. Synthetic insulation is the less-expensive option, so all budget-friendly sleeping bags will have it. Usually synthetic insulation is made from polyester, nylon, or cotton, and it is durable, hypoallergenic and fast drying. But, synthetic fill can be bulkier and heavier than down fill. Some people may want to splurge on a down-filled bag because it is recommended by the pros, but down insulation can be an allergen and is virtually ruined if it gets wet. What are the top six budget sleeping bags? Here is a summary of the top six budget sleeping bags, each offering a unique combination of desirable features. All of these products are highly rated, sleep tested, and under $25. The Sunridge bag is a warm weather, adult sleeping bag rated for temperatures between 40 and 60 degrees Fahrenheit. It has synthetic, polyester insulation, with a brushed polyester outer shell. 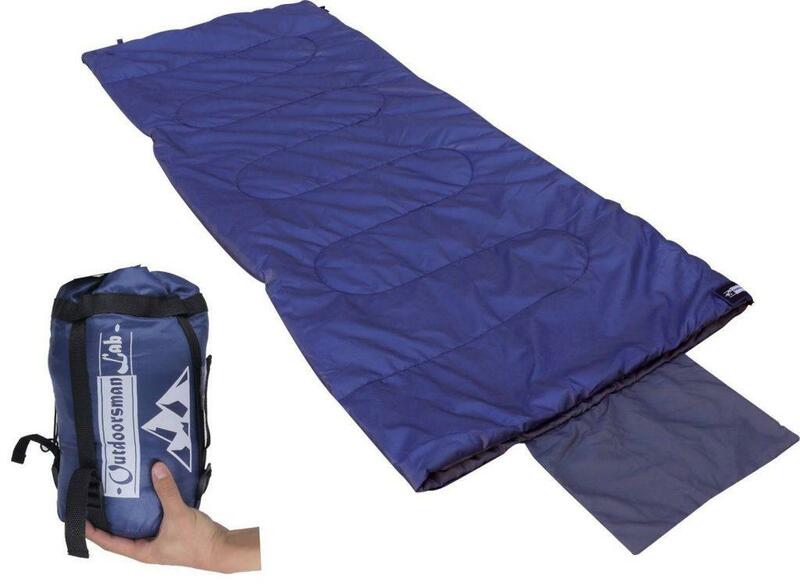 This sleeping bag can accommodate people up to 5 feet 11 inches tall, and it is equipped with ZipPlow and Roll Control. ZipPlow is Coleman’s system for keeping fabric away from the zipper to prevent snags, and Roll Control makes it easy for one person to roll up and pack the sleeping bag. The Sunridge bag has a rectangular shape, and it can be zipped to a second bag to accommodate two sleepers. The Outdoorsman Lab Lightweight Sleeping Bag is ideal for warm-weather camping trips, with a temperature rating of 55 to 75 degrees Fahrenheit. It has several special features, including an integrated pillowcase, an interior pocket, and straps for a sleeping pad. 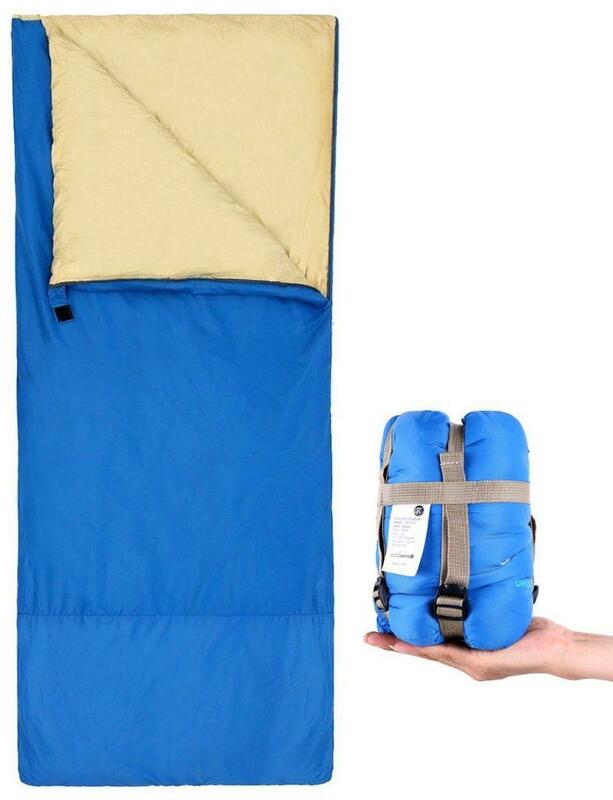 This sleeping bag is ultralight, weighing just 1.6 pounds, and it measures 73 inches by 29.5 inches. Its shell is water repellent, plus it comes with a compression sack for storing and transporting. This bag can also be zipped to a second bag to accommodate two sleepers. Outdoorsman Lab offers discounts when purchasing one or more of their products together. 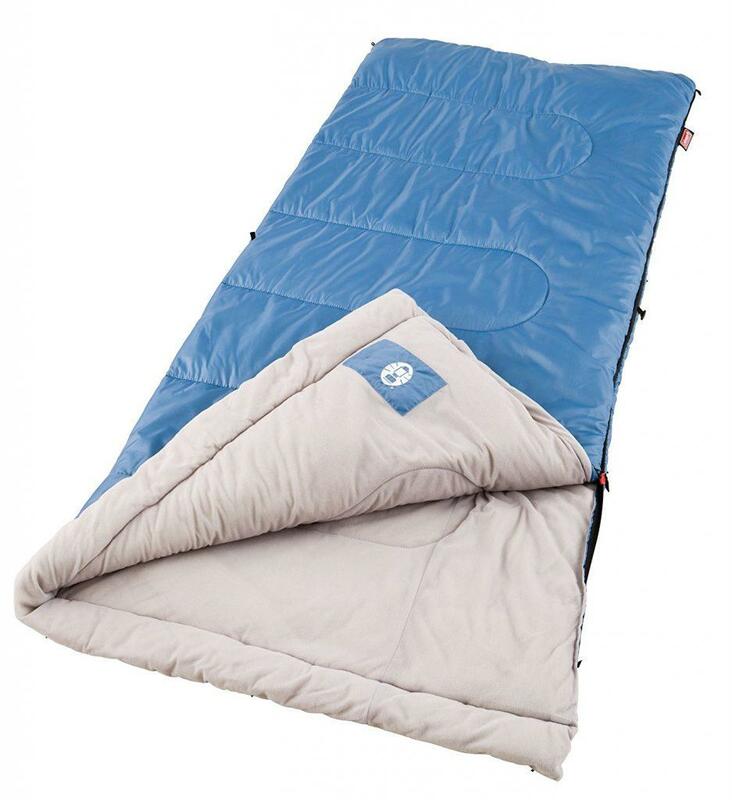 The Ohuhu Sleeping Bag is a rectangular-shaped, waterproof bag with a nylon shell and synthetic polyester insulation. It is lightweight at only 1.72 pounds, and it comes with a space-saving carrying sack. This bag is rated for temperatures between 48 and 60 degrees Fahrenheit. Unlike many other bags, this one has the option of a left-side zipper or a right-side zipper. Both options measure 75 inches by 34 inches when unrolled, and two bags can be zipped together to accommodate two sleepers at once. 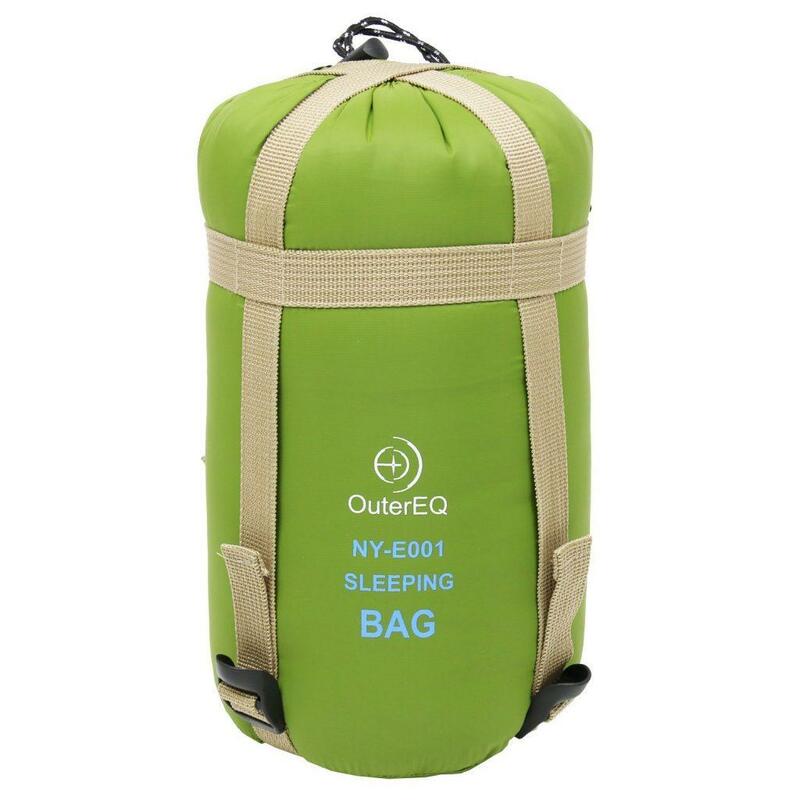 The OuterEQ Sleeping Bag is lightweight and comfortable for people up to 5 feet 11 inches tall. It has a polyester shell, a soft cotton liner, and cotton synthetic insulation. 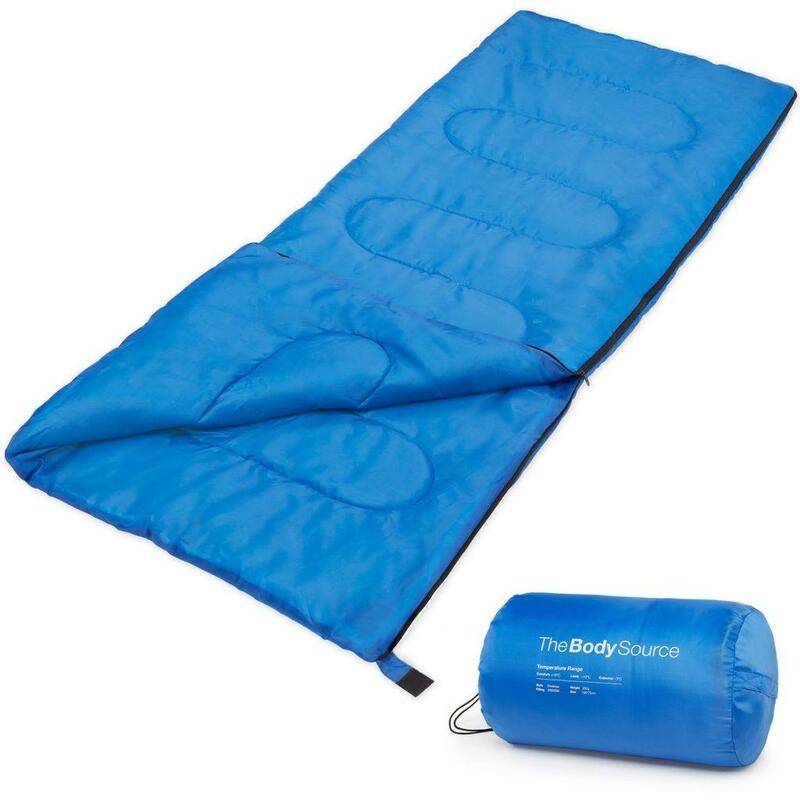 This rectangular sleeping bag has a temperature rating of about 50-60 degrees Fahrenheit, plus it is machine washable. The OuterEQ bag comes with a convenient compression sack for each storage and transport, and it is available in army green and dark blue. OuterEQ also offers discounts when purchasing two or more of their camping products together. 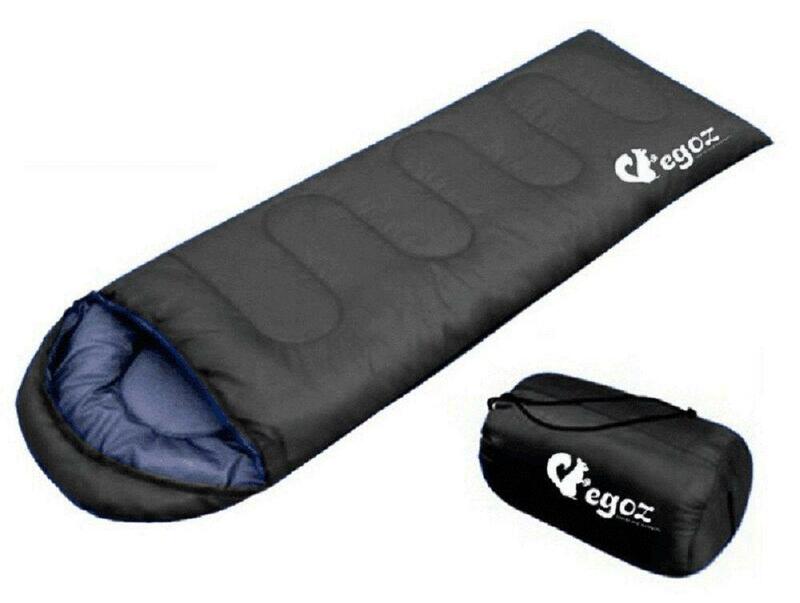 The Egoz Peanut is a modified rectangular sleeping bag that has a drawstring hood to keep your head warm. It is rated for 40 to 50 degrees Fahrenheit temperatures, and it is built with synthetic 300 GSM insulation, a cotton liner, and a polyester shell. This water-resistant bag comes with a drawstring carrying bag, and it measures 83 inches by 30 inches, so it can accommodate someone up to 6 feet 6 inches tall. This bag is easy to clean and built to last. The Active Era Premium bag is a water-resistant, warm-weather sleeping bag. It is rated for temperatures between 50 and 60 degrees Fahrenheit, but with the right clothing, it is safe in temperatures as low as 25 degrees Fahrenheit. The Active Era bag is constructed with synthetic 200GSM hollow fibre filling, and a polyester shell. This extremely lightweight, rectangular bag is machine washable and comes with a carrying bag that’s equipped with a handle and drawstring. It measures 75 inches by 30 inches, and it weighs just over 2 pounds. What else should you consider when using and purchasing budget sleeping bags? There is more to consider when buying a sleeping bag on a budget. First, think about the other people on your camping trip. There is an even bigger incentive to look for inexpensive sleeping bags if you are purchasing them for multiple people, but as mentioned earlier, not all budget sleeping bags are the same. Some sleeping bags are gender and age specific, which affects the warmth of the bag. Luckily, there are budget-friendly sleeping bags available for everyone in your party. Next, think about any extras you would want. There are several sleeping bag accessories available, but those could stretch the budget. If you are tempted to buy specialized pads, shells, pillows, or the like, there are cheaper ways to get the same result. Most of these products can be replaced by regular blankets or heavy clothing. Bring along a large comforter for more padding under the sleeping bag, layer up for more warmth, and bunch up a sweatshirt for the perfect camping pillow. Plus, a water repellant spray can replace a shell, and it can be used on multiple pieces of equipment. Lastly, it is critical to not expect the quality of a REI, L.L. Bean, or North Face brand sleeping bag when purchasing a bag that is under $25. In general, the sleeping bags on the list above are meant for casual campers on an occasional basis, not for extreme temperatures and professional expeditions. If you keep this in mind, you will be extremely happy with the quality you get for an inexpensive bag. Sleeping bags are cheaper and more accessible than ever, so if you are looking for a quality bag at a great price, it’s certainly possible to find it. But, it is important to note that the expression “you get what you pay for” could always come into play when buying inexpensive items, so budget sleeping bags will never be top of the line, but they can address your sleeping bag needs. In the end, determining the best bag for you and your adventure is all about weather, weight, shape, size, insulation, and your comfort.